Thu, March 21, 2019 12:00 P.M.
Social media posts that include images can help increase your engagement by 650%! Learn how to use Canva, a free design tool, to up your visual content game. Some computers will be available for hands-on practice but we strongly encourage you to bring your own (fully-charged) laptop, tablet, or mobile device. A Free Library library card is required to access wifi. All sessions are free but registration is requested as space is limited. Click here to register. 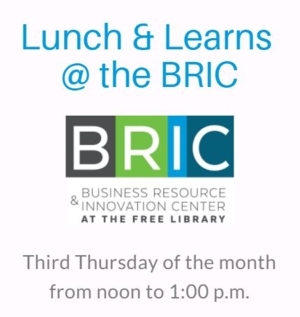 The Business Resource & Innovation Center (BRIC) is excited to offer monthly lunch and learn sessions on the third Thursday of the month from 12:00 p.m. to 1:00 p.m. These sessions will be an opportunity to learn a new skill, get hands-on experience, and network with peers. Check out our upcoming Lunch & Learns here.